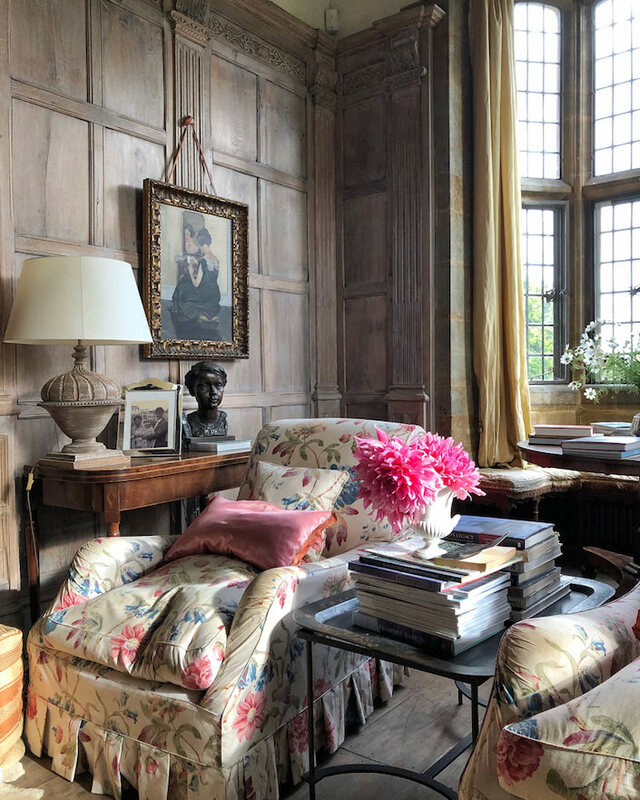 When in England last fall shooting for Susanna Salk’s At Home with Dogs and Their Designers in the English Countryside (coming spring 2020 from Rizzoli), we photographed at Wardington Manor, the home of Bridget Ellsworthy, one half of The Land Gardeners. Its enchanting interiors, especially the sitting room, below, with its soaring height, gothic windows and faded chintz, somehow reminded me of the great illusory Manderley. And then I heard that a remake of Rebecca starring Lily James and Armie Hammer is coming to Netflix. So I thought we’d take a moment to visit a bit of the story behind the style of Rebecca and Manderley, the grand Cornwall estate by the sea, home to Olivier’s character, the dashing George Fortescue Maximilian de Winter (Maxim). 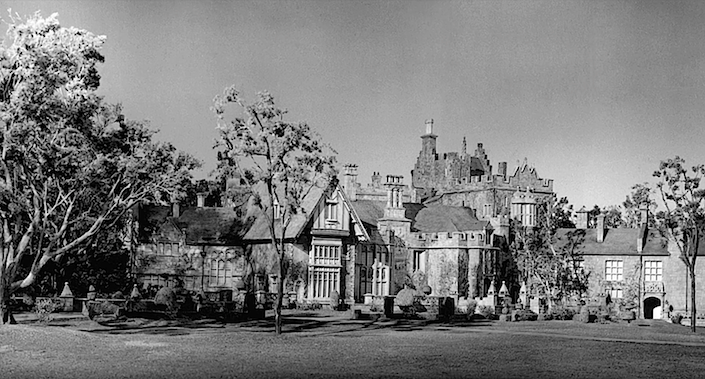 Since it was impossible to shoot in England in turbulent 1940, Manderley had to be created in Hollywood. What you may not realize is that the exterior of this fictional 16th c. manse was not an actual building or even full size set but rather built with miniatures and matte paintings (an example of this techinque in an early scene above) in two different scales – the larger at 50 feet wide. 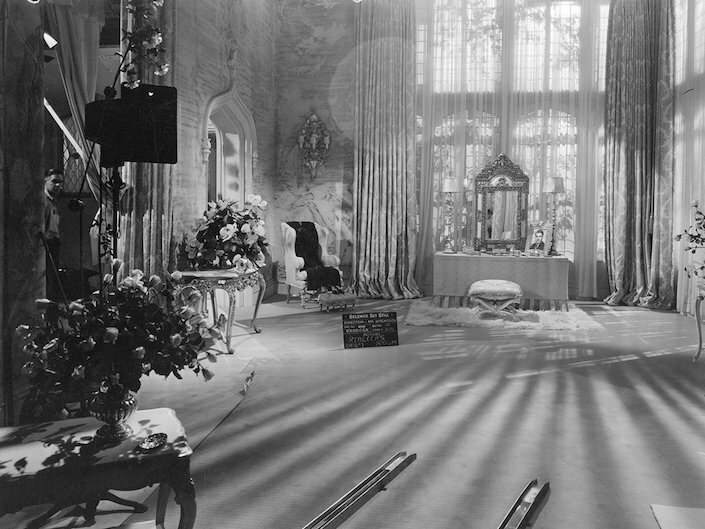 And the interiors not only echoed the age and style of the exterior but were especially lofty to not only simulate the grand mansion but also dwarf Joan Fontaine’s character. In fact Olivier had wanted to star with his then fiancee Vivien Leigh but producer David O. Selznick felt she was too strong a personality and wouldn’t be convincing as the meek and intimidated second Mrs. de Winter. The inspiration for Manderley was born of du Maurier’s obsession with an abandoned Georgian country house in Cornwall, Menabilly, above, that she had coveted since her youth. It wasn’t until 1943, five years after the publication of Rebecca, with the financial rewards she reaped from it, that du Maurier finally got to live there. 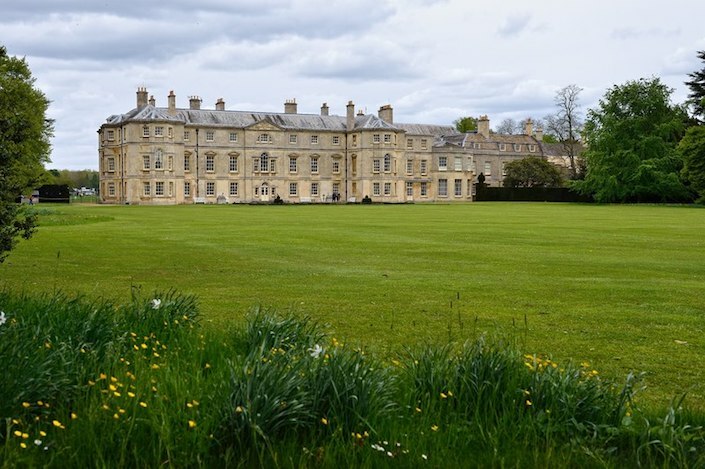 And while Menabilly may have inspired the hidden country setting for Manderley, Milton Hall in Cambridgeshire, below, was the inspiration for the grand architecture and interiors. 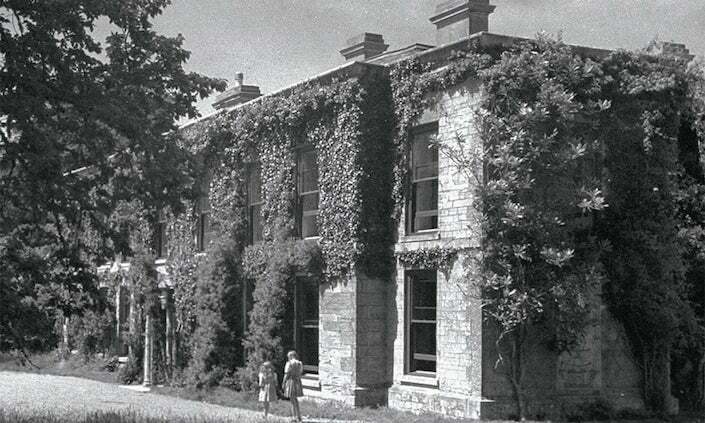 Du Maurier had strong childhood memories of visits there in 1917 when it was being used as a convalescent home for British Army officers. 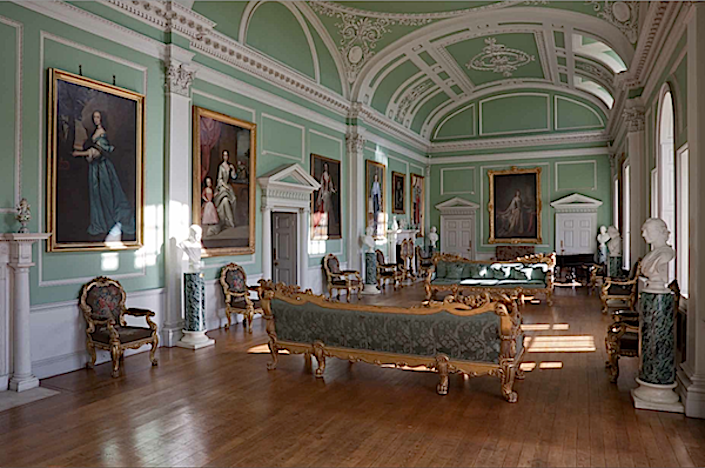 You may recognize it from The English Country House – the gallery with its spectacular three part ceiling, designed in the early 1700s, below. 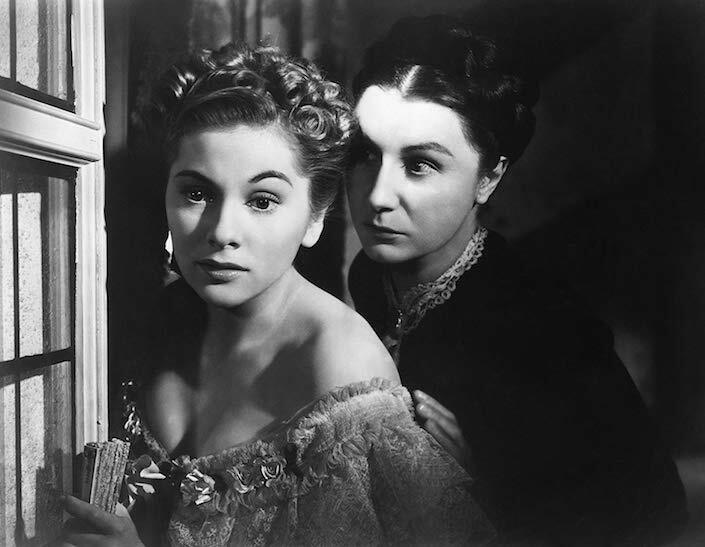 And a particularly menacing housekeeper at Milton Hall was evidently the source for the character of the legendary Mrs. Danvers, whose bizarre dedication to her former employer (the “real Mrs. de Winter”) is part of the subtle psycho-sexual drama of the movie. The psychological suspense of Rebecca held special appeal for Selznick as well as Hitchcock. 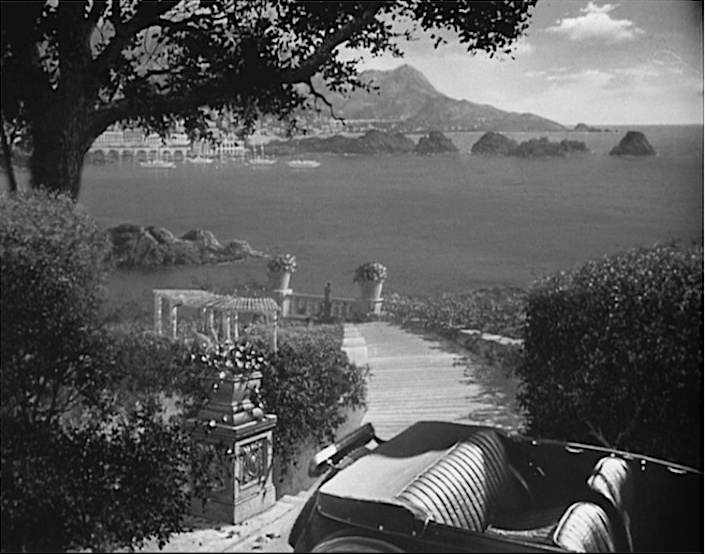 And, like du Maurier, houses and interiors held particular significance for the director who felt they were an additional way to portray the psychic landscape of his characters. 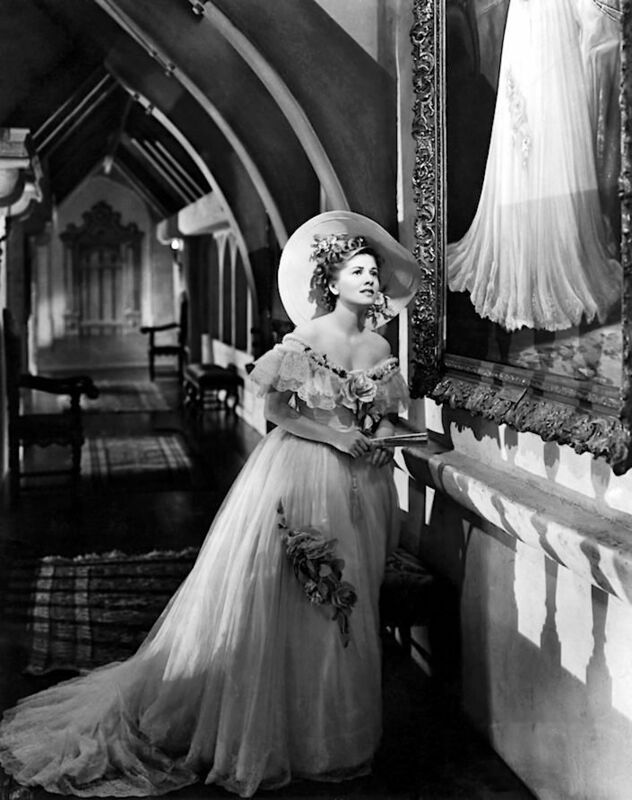 At Manderley, the beautiful deceased Rebecca continues to rule and it lives on as one of the great houses in film. Hitchcock’s fascination with du Maurier continued in The Birds, which, after his long standing contentious relationship with Selznick, he produced himself. It remains to be seen how Manderley will be represented in the new version of Rebecca. This entry posted in architecture, books, film, interior design. Entry Tags: Hitchcock, Manderley, Rebecca, Style in film Bookmark the permalink. Rebecca is my favorite movie. I have probably seen it over twenty times. Every time we go into Rebecca’s room I think I will see more of the room and more of her clothes. Vivian Leigh DID star in Rebecca for if there ever was an embodiment if that gorgeous character it was Vivian. You can see her black hair blowing in the wind with a hauty, defiant look on her face. It is a tribute to the writing that a reader can have strong visuals of the house, the grounds, the water and the characters. It’s an unforgettable read and sits next to Pride & Prejudice and Anna Karenina on my shelf. This morning’s post is a delightful revisit to adventure and dreams. Thanks Judith – and so true! How excellent to revisit old memories and old books! Love the black and white photos…..a welcome change and much more striking than color. My pleasure Patricia! I love the old black and whites as well. There are some excellent new movies filmed in black and white – have you seen Roma? Aren’t they fabulous?! More of this room and house when the book comes out next year! On a trip to England in 2008, a woman with whom I was traveling had been to Menabilly because she knew one of the DuMaurier children. When Rebecca became a bestseller, Daphne let Menabilly from the Rashleigh family, who had owned it for 400 years. She used her own money to restore the nearly derelict house. They allowed her to renew the lease once, but after she had occupied and improved the house for 22 years, they canceled the lease. Back to my 2008 trip to England – we visited Milton Hall, which is quite beautiful. Grand, but still a house of warmth and beauty, with sheep grazing on the lawn and enormous stables. I was thrilled to be there. The estate manager read an excerpt from a letter that Daphne had written to the 10th Earl Fitzwilliam, stating that she thought of its interiors as representative of the kind of house that Manderley would have been. Quite a tribute. Fascinating! I knew she had rented and restored Menabilly but didn’t know they had canceled the lease after 22 years. How heartbreaking. And the tidbit about the letter so good. What a beautiful post. Somehow I’ve never been able to get through the original film with Laurence Olivier and Joan Fontaine. Perhaps if I had read the book I would feel more of a connection. I was not aware of a remake with Armie Hammer and Lily James. I love to watch both of these actors, so I will certainly look for it. Thank you for giving me a head’s up Stacy. I always look forward to your wonderful posts. Thank you Lisa. I think you should give it a try again – it really is marvelous! I’m hoping and crossing my fingers that the remake will be nearly as good as the original movie. I’m not usually a fan of remakes, but I’ll certainly give it a try! I can’t imagine it will be but will give it a try as well! Nothing better in cold dreary weather than classic movies, esp. Hitchcock. Wardington Manor is simply gorgeous, as is Sir Laurence! Since you mentioned shooting portraits for your upcoming book with Susanna, Dogs and their Designers, British Edition (can’t wait!) I thought I’d chime in that Hitchcock was known to adore his Sealyham Terriers. The breed was very popular with movie stars in the 30’s and 40’s and there are many photos of him with Sealys on Google. Hitchcock was also known for appearing in cameo in each of his movies, and in The Birds, as Tippi Hedren enters a Davidson’s Pet Shop, Hitchcock simultaneously exits the shop with his two Sealys on lead, immortalized in celluloid. I know all this trivia because aside from being a classic film and dog lover, my Plohni is a Sealyham. I’m also certain Hitchcock loved them for their wonderful senses of humor, also good for cold dreary days. Thanks for a great post! Thank you Marghuerite – I did not know that about Hitchcock and his dogs! I know he appears in all his films (love him in the back of the bus in To Catch a Thief) but will have to check out that clip in The Birds again! Great post. I have loved this book and most of the movie ever since I first read it in highschool. About 20 years ago one of the original scripts from the movie was offered at my local auction house. I was a very poor Graduate student at the time and could not even consider bidding, but I sat and read through it up until the staff had to “remove” it from me in order to start the bidding. Wonderful Post !! I love to see the Movie someday ! Thank you Stacey. Thank you so much Stephanie and love your mutual adulation of Rebecca and interiors! nice collection of old memories. 83 queries in 0.637 seconds.